Assistant Professor in the Department of Family Medicine at the University of Ottawa in Ontario, Adjunct Assistant Professor in the School of Pharmacy at the University of Waterloo in Ontario, and Scientist at the Bruyère Research Institute at the University of Ottawa. Associate Professor in the Department of Family Medicine and the School of Epidemiology, Public Health and Preventive Medicine at the University of Ottawa and Scientist at the Bruyère Research Institute. Master’s student in the School of Epidemiology, Public Health and Preventive Medicine at the University of Ottawa at the time of guideline development. Resident in the Department of Pharmacy at the Ottawa Hospital at the time of guideline development. Project coordinator with the Bruyère Research Institute during guideline development. Pharmacist with the Toronto Central Community Care Access Centre in Ontario. Director of the Methods Centre at the Bruyère Research Institute and Assistant Professor in the School of Epidemiology, Public Health and Preventive Medicine at the University of Ottawa. Director of the Division of Gastroenterology at McMaster University in Hamilton, Ont. Objective To develop an evidence-based guideline to help clinicians make decisions about when and how to safely taper or stop proton pump inhibitors (PPIs); to focus on the highest level of evidence available and seek input from primary care professionals in the guideline development, review, and endorsement processes. Methods Five health professionals (1 family physician, 3 pharmacists, and 1 gastroenterologist) and 5 nonvoting members comprised the overall team; members disclosed conflicts of interest. The guideline process included the GRADE (Grading of Recommendations Assessment, Development and Evaluation) approach, with a detailed evidence review in in-person, telephone, and online meetings. Uniquely, the guideline development process included a systematic review of PPI deprescribing trials and examination of reviews of the harm of continued PPI use. Narrative syntheses of patient preferences and resource-implication literature informed recommendations. The team refined guideline content and recommendation wording through consensus and synthesized clinical considerations to address common front-line clinician questions. The draft guideline was distributed to clinicians and then to health care professional associations for review and revisions made at each stage. A decision-support algorithm was developed in conjunction with the guideline. Recommendations This guideline recommends deprescribing PPIs (reducing dose, stopping, or using “on-demand” dosing) in adults who have completed a minimum of 4 weeks of PPI treatment for heartburn or mild to moderate gastroesophageal reflux disease or esophagitis, and whose symptoms are resolved. The recommendations do not apply to those who have or have had Barrett esophagus, severe esophagitis grade C or D, or documented history of bleeding gastrointestinal ulcers. 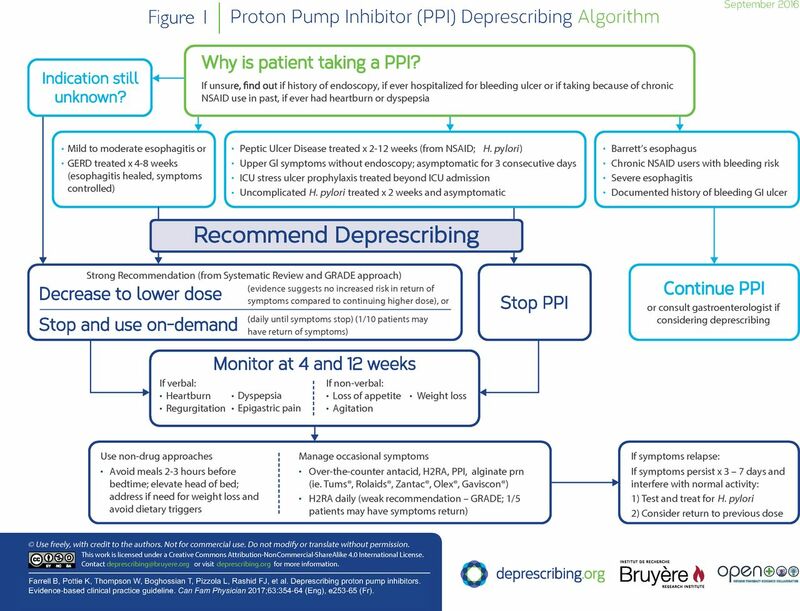 Conclusion This guideline provides practical recommendations for making decisions about when and how to reduce the dose of or stop PPIs. Recommendations are meant to assist with, not dictate, decision making in conjunction with patients. Deprescribing is the planned and supervised process of dose reduction or stopping of medication that might be causing harm or might no longer be providing benefit.1 The goal of deprescribing is to reduce medication burden and harm while maintaining or improving quality of life. However, deprescribing can be difficult, especially when medications do not appear to be causing overt harm.2 In an effort to provide evidence-based recommendations and tools to aid clinicians in stopping medications that might no longer be needed or that might be causing harm, we initiated the Deprescribing Guidelines in the Elderly project (www.open-pharmacy-research.ca/research-projects/emerging-services/deprescribing-guidelines). Our target audience includes primary care physicians, pharmacists, nurse practitioners, and specialists who care for patients who might use PPIs. The target population includes adults older than 18 years of age (including the elderly) taking a continuous PPI for longer than 28 days for the purpose of treating GERD or esophagitis. The guideline does not apply to those with Barrett esophagus, those with severe esophagitis (grade C or D on endoscopy, as outlined in Box 1),26 or those with documented history of bleeding gastrointestinal (GI) ulcers. Individual situations in which there might be risk factors that warrant continued use of PPIs are also outlined. GRADE—Grading of Recommendations Assessment, Development and Evaluation; PPI—proton pump inhibitor. The systematic reviews focused on outcomes relevant to patients, caregivers, and health care providers. Primary outcomes included change in upper GI symptoms (positive or negative), pill burden, and cost. Secondary outcomes included patient satisfaction, positive drug withdrawal events (eg, resolution of a side effect such as diarrhea), and adverse drug withdrawal events (eg, recurrence of esophagitis on endoscopy). Draft recommendations were initially formulated by the GDT members (during an in-person meeting) from the evidence tables using confidence in estimated effects (following dose lowering, switching to on-demand therapy, or stepping down to H2RA therapy), and taking into account literature on patient preferences for PPI use, a review of harms of continuing PPIs, team members’ clinical experience with such harms, and resource implications (both in terms of PPI costs and costs that might be associated with complications arising from stopping PPIs). The GDT members met by teleconference to review and discuss recommendations drafted from the in-person meeting. Voting on the recommendations was subsequently conducted anonymously by e-mail. Unanimous agreement was sought; 80% agreement among the 5 GDT members was considered the cutoff for consensus. All 5 members of the PPI deprescribing GDT agreed with the final recommendations. The recommendations are outlined in Box 4. The algorithm developed for this guideline is provided in Figure 1. The rationale for the recommendations is outlined in Table 1. The recommendations apply to adults who have completed a minimum 4-week course of PPIs for upper GI symptoms. The evidence base mainly relates to patients with GERD or esophagitis but can be extrapolated to other upper GI disorders for which the efficacy of PPIs is more modest or for which short-term use is usually recommended (eg, stress ulcer prophylaxis, peptic ulcer disease) and therefore deprescribing is likely to be more effective.34 The recommendations do not apply to those who have or have had Barrett esophagus, severe esophagitis grade C or D, or documented history of bleeding GI ulcers. Evidence to recommendations table: Does deprescribing PPIs (dose reduction, on-demand use, abrupt discontinuation, stepping down to H2RA therapy) compared with continuous PPI use result in benefits or harms for adults > 18 y (excluding those with history of bleeding ulcer, Barrett esophagus, and severe esophagitis grade C and D) in primary care and long-term care settings? For those with mild to moderate GERD or upper GI symptoms who have no ongoing symptoms, lowering the dose of a PPI does not lead to significantly greater relapse compared with continuing at a standard dose. Lowering the PPI dose was believed to have greater benefit than harm owing to a lack of evidence of harm, the potential to reduce costs, and the potential to reduce the risk of rare PPI side effects and drug interactions. Both on-demand therapy and stepping down to H2RA therapy increase the risk of symptom relapse more so than lowering the dose does. However, on-demand use is associated with lower pill burden and cost, which might be desirable to patients. Please refer to Box 229–32 for definitions of the strength and quality of deprescribing trial evidence and to Table 1 for evidence to recommendations considerations across all decision domains (quality of evidence, balance of benefits and harms, patient values and preferences, and resource implications). Based on a lack of evidence of serious harm from deprescribing, the evidence for the benefits of reducing inappropriate PPI use in terms of pill burden and reduced risk of side effects, the high societal cost of inappropriate PPI use, and the feasibility of a PPI deprescribing intervention, we rated the recommendation to lower the dose or switch to on-demand PPI use as strong. The recommendation to step down to H2RA therapy was rated as weak owing to the higher risk of symptom return. The following questions were articulated by the GDT as being important to consider when making decisions about the steps for deprescribing PPIs. Are there indications or risk factors that warrant continued use? An important first step is determining the original indication for the PPI and whether there are ongoing risk factors for GI disease that warrant chronic use. Reviewing patient history and consultation notes for evidence of Barrett esophagus, grade C or D esophagitis, or documented history of bleeding GI ulcers will identify patients for whom deprescribing is unlikely to be beneficial. Advice should be sought from gastroenterologists for these patients to assess ongoing risk factors. How should tapering be approached? Our systematic search did not identify trials that adequately addressed optimal tapering approaches to minimize symptom recurrence. There is very low-quality evidence that abrupt discontinuation (without tapering or using on-demand strategies) does increase symptom relapse. 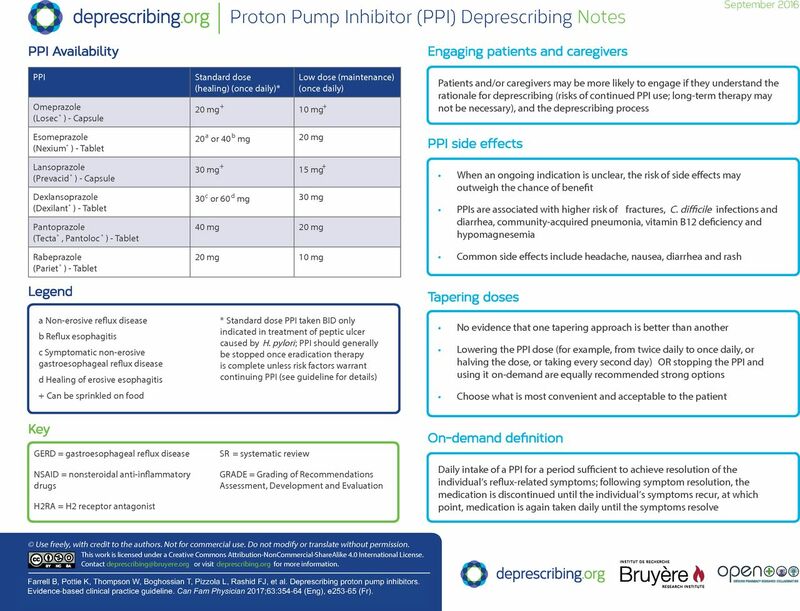 Therefore, it might be prudent to reduce the PPI to the lowest effective dose before discontinuation and to provide patients with a symptom management strategy that might include on-demand PPIs. Anecdotally, clinicians seem to prefer gradual dose reduction (eg, from twice daily to once daily, from high dose to low dose, from daily to every other day) and any of these approaches can be used, taking into consideration the patient’s current medication supply, as well as the convenience of the approach. Explaining the rationale for deprescribing PPIs, and the option of beginning with lowering the dose or using on-demand therapy, will facilitate patient and family acceptance. What monitoring needs to be done and how often, and how should symptoms be managed? Differentiating “rebound hypersecretion” from symptoms of an underlying disorder such as GERD is challenging. 51 While studies of healthy volunteers taking PPIs have resulted in acid-related symptoms following deprescribing, the clinical significance remains unknown.51–53 Regardless, we recommend monitoring for symptom recurrence and managing symptoms with on-demand PPIs, stepping down to H2RA therapy (if appropriate, safe, and effective for the patient), other over-the-counter agents (eg, calcium carbonate), or nonpharmacologic approaches. What other approaches help with PPI deprescribing? External clinical review of the guideline was conducted by a practising family physician and a pharmacist using the AGREE II (Appraisal of Guidelines for Research and Evaluation) Global Rating Scale tool.58 Relevant stakeholder organizations (ie, gastroenterology, family practice, pharmacy, and nurse practitioner) were invited to similarly review and endorse the guidelines (Box 5). Modifications were made to the original guideline draft to address reviewer comments. Current GERD and peptic ulcer disease guideline recommendations support a short duration of PPI use and suggest attempting to discontinue PPIs in most patients or maintaining therapy at the lowest effective dose.8,33 There is no information in current guidelines that assists clinicians with deprescribing PPIs (ie, tapering, discontinuation, or use of intermittent, step-down, or on-demand strategies). While a limited number of protocols for deprescribing PPIs have been proposed, there are no comprehensive evidence-based guidelines available for deprescribing PPIs.57,59 A PPI deprescribing guideline works in conjunction with current treatment guidelines because it offers clinicians recommendations and clinical considerations to help them deprescribe PPIs in patients after an appropriate treatment duration or if long-term therapy is being reevaluated. Proton pump inhibitors are used for a number of reasons; however, most deprescribing research has been done in relatively healthy patients (primarily adults and younger elderly patients) with mild or moderate GERD or esophagitis only. In conditions for which PPI treatment is usually of limited duration (eg, intensive care unit stress ulcer prophylaxis, peptic ulcer disease, H pylori treatment) or uncertain effectiveness (eg, cough), there were no trials that compared a deprescribing approach with continuous PPI use. In addition, the optimal approach to deprescribing PPIs has not been evaluated (eg, tapering before stopping). Direct comparison of different deprescribing approaches (to one another and to continuous PPI use, as well as various tapering approaches and stepping down to H2RA therapy) would be helpful to determine if there is a best approach. Trials examining the outcomes of deprescribing for the frail elderly or those with other conditions (aside from GERD or esophagitis) would help clinicians weigh the harms and benefits of deprescribing in patients who might also be at higher risk of adverse effects of continued PPI treatment. Studies employed different definitions of symptom relapse and patient satisfaction; consistency would be helpful to improve the quality of the body of evidence and should include patients’ perspectives in terms of what is meaningful to them. Attention to both the positive (such as resolution of side effects caused by the PPI) and negative (such as recurrence of upper GI symptoms) patient-specific effects of PPI deprescribing, particularly over the longer term, would be helpful. Evaluating cost-effectiveness and long-term medical resource use is also important. The deprescribing team will provide routine guideline updates as new evidence emerges that might change the recommendations. Prospective evaluation of the effects of adoption of this and other deprescribing guidelines will be part of a research strategy in the future. Overuse of medication is acknowledged to be a key contributor to polypharmacy, with attendant negative effects on health. Proton pump inhibitors are commonly indicated for short-term use, and the potential for harm is not insignificant. A systematic review identified that PPIs can be safely deprescribed in many patients taking them for the common indications of GERD and mild esophagitis. This evidence-based guideline is the first in a series of guidelines aimed at helping clinicians make decisions about when and how to safely stop medications. Implementation of such guidelines will encourage clinicians to carefully evaluate the ongoing use of medications and potentially reduce the negative effects of polypharmacy. We thank Ms Shannon Gordon, Bibliometrics and Research Impact Librarian, and Mr Zain Hudani, graduate student, from the University of Waterloo in Ontario, for their assistance with the review of harms, and Dr Norah Duggan and Ms Candra Cotton for their clinical review of the guideline and invaluable feedback. We are also grateful to review committee members from the following organizations for their thoughtful comments: the Canadian Association of Gastroenterology, the Canadian Nurses Association, the College of Family Physicians of Canada, the Canadian Pharmacists Association, the Canadian Society of Consultant Pharmacists, the Ontario Pharmacists Association, and RxFiles. We also thank Mr Michael Elten and Mr Cody Black for administrative assistance in preparing the guideline for publication. Funding was provided by the Government of Ontario. Many patients continue to take proton pump inhibitors (PPIs) beyond the recommended course of treatment, and this has potential for harm and large economic implications. Systematic review of the evidence for PPI deprescribing (reducing dose, discontinuing, switching to “on-demand” dosing) failed to demonstrate important clinical harms in deprescribing PPIs in adults. This guideline recommends deprescribing PPIs in adults who have completed a minimum 4-week course of PPI treatment, resulting in resolution of upper gastrointestinal symptoms. Future PPI deprescribing research should address deprescribing for other PPI indications and in the frail elderly population, optimal tapering regimens or alternate treatments to minimize symptom recurrence, consistent approaches to measuring outcomes, measurement of both positive and adverse drug withdrawal events, long-term harms and benefits, and costs. ↵* Descriptions of contributors’ expertise, roles, and conflicts of interest; the GRADE evidence tables; frequency ratios for the harms associated with proton pump inhibitor use; evidence reviews; a patient handout; and an easy-to-print version of the algorithm are available at www.cfp.ca. Go to the full text of the article online and click on the CFPlus tab. La traduction en français de cet article se trouve à www.cfp.ca dans la table des matières du numéro de mai 2017 à la page e253. All authors made substantial contributions to the conception and design of the guideline; the acquisition, analysis, and interpretation of data; and drafting the article, revising it critically for important intellectual content, and approving the final version. Dr Farrell received research funding to develop this guideline; received financial payments from the Institute for Healthcare Improvement and Commonwealth Fund for a deprescribing guidelines summary; and from the Ontario Long Term Care Physicians Association, the Ontario Pharmacists Association, and the Canadian Society of Hospital Pharmacists for speaking engagements. Dr Moayyedi holds a chair partially funded by AstraZeneca and has received financial payments from AstraZeneca for speaking engagements. None of the other authors has any competing interests to declare.
. Deprescribing: what is it and what does the evidence tell us? Can J Hosp Pharm 2013;66(3):201-2.
. Qualitative insights into general practitioners views on polypharmacy. BMC Fam Pract 2010;11:65.
. What are priorities for deprescribing for elderly patients? Capturing the voice of practitioners: a modified Delphi process. PLoS One 2015;10(4):e0122246.
. Magnitude and economic effect of overuse of antisecretory therapy in the ambulatory care setting. Am J Manag Care 2010;16(9):e228-34.
. Overutilization of proton pump inhibitors: a review of cost-effectiveness and risk. Am J Gastroenterol 2009;104(Suppl 10):S27-32. Errata in: Am J Gastroenterol 2009;104(4):1072;Am J Gastroenterol 2009;104(Suppl 2):S39. Canadian Optimal Medication Prescribing and Utilization Service. Evidence for PPI use in gastroesophageal reflux disease, dyspepsia and peptic ulcer disease. Ottawa, ON: Canadian Agency for Drugs and Technologies in Health; 2007. Top 100 drugs. Pharm Pract 2013 Mar 4. Available from: www.canadianhealthcarenetwork.ca/pharmacists/magazines/pharmacypractice/february-2013. Accessed 2017 Apr 10.
. Guidelines for the diagnosis and management of gastroesophageal reflux disease. Am J Gastroenterol 2013;108(3):308-28. Epub 2013 Feb 19. Erratum in: Am J Gastroenterol 2013;108(10):1672.
. Who is using chronic acid suppression therapy and why? Am J Gastroenterol 2003;98(1):51-8.
. Peptic ulcer disease. Am Fam Physician 2007;76(7):1005-12.
. Overuse of acid-suppressive therapy in hospitalized patients. Am J Gastroenterol 2000;95(11):3118-22.
. Overuse of proton pump inhibitors. J Clin Pharm Ther 2008;25(5):333-40.
. Overutilization of protonpump inhibitors: what the clinician needs to know. Therap Adv Gastroenterol 2012;5(4):219-32.
. Inappropriate prescribing of proton pump inhibitors in primary care. Postgrad Med J 2007;83(975):66-8.
. The prevalence of diarrhea and its association with drug use in elderly outpatients: a multicenter study. Am J Gastroenterol 2008;103(11):2816-23. Epub 2008 Aug 21.
. Proton pump inhibitor and histamine 2 receptor antagonist use and vitamin B12 deficiency. JAMA 2013;310(22):2435-42.
. Concordance between use of proton pump inhibitors and prescribing guidelines. Med J Aust 2000;172(1):16-8.
. FDA drug safety communication: Clostridium difficile–associated diarrhea can be associated with stomach acid drugs known as proton pump inhibitors (PPIs). Silver Spring, MD: US Food and Drug Administration; 2013.
. Meta-analysis: risk of fractures with acidsuppressing medication. Bone 2011;48(4):768-76. Epub 2010 Dec 23.
. Proton pump inhibitor-associated pneumonia: not a breath of fresh air after all? World J Gastrointest Pharmacol Ther 2011;2(3):17-26.
. A benefit-risk assessment of the use of proton pump inhibitors in the elderly. Drugs Aging 2014;31(4):263-82.
. The prescribing cascade. Aust Prescr 2011;34:162-6.
. The impact of polypharmacy on the health of Canadian seniors. Fam Pract 2012;29(4):427-32. Epub 2012 Jan 5.
. The effects of polypharmacy in older adults. Clin Pharmacol Ther 2009;85(1):86-8. Epub 2008 Nov 26. Prescribed drug spending in Canada, 2013: a focus on public drug programs. North York, ON: Canadian Institute for Health Information; 2015. Available from: https://secure.cihi.ca/free_products/PrescribedDrugSpendinginCanada_2014_EN.pdf. Accessed 2017 Mar 21.
. Los Angeles Classification of esophagitis using image processing techniques. Int J Comput Appl 2012;42(18):45-50.
. Guidelines 2.0: systematic development of a comprehensive checklist for a successful guideline enterprise. CMAJ 2014;186(3):E123-42. Epub 2013 Dec 16.
. Methodology for developing deprescribing guidelines: using evidence and GRADE to guide recommendations for deprescribing. PLoS One 2016;11(8):e0161248.
. GRADE guidelines: 1. Introduction-GRADE evidence profiles and summary of findings tables. J Clin Epidemiol 2011;64(4):383-94. Epub 2010 Dec 31.
. Deprescribing versus continuation of chronic proton pump inhibitor use in adults (protocol). Cochrane Database Syst Rev 2015;(11):CD011969.
. Deprescribing versus continuation of chronic proton pump inhibitor use in adults. Cochrane Database Syst Rev 2017;(3):CD011969.
. Medical treatments for the maintenance therapy of reflux oesophagitis and endoscopic negative reflux disease. Cochrane Database Syst Rev 2004;(2):CD003245.
. The efficacy of proton pump inhibitors in non-ulcer dyspepsia: a systematic review and economic analysis. Gastroenterology 2004;127(5):1329-37.
. Peptic ulcer disease. Lancet 2009;374(9699):1449-61. Epub 2009 Aug 13. Practice Parameters Committee of the American College of Gastroenterology. Guidelines for prevention of NSAID-related ulcer complications. Am J Gastroenterol 2009;104(3):728-38. Epub 2009 Feb 24. American College of Gastroenterology guideline on the management of Helicobacter pylori infection. Am J Gastroenterol 2007;102(8):1808-25. Epub 2007 Jun 29. Economic models and conclusions for the treatment of dyspepsia; and gastroesophageal reflux disease-related heartburn and the prevention of non-steroidal antiinflammatory drug-induced gastrointestinal complications. Ottawa, ON: Canadian Agency for Drugs and Technologies in Health; 2007.
. Longterm treatment of gastro-oesophageal reflux disease patients with frequent symptomatic relapses using rabeprazole: on-demand treatment compared with continuous treatment. Aliment Pharmacol Ther 2005;21(7):805-12.
. Maintenance treatment of gastroesophageal reflux disease: an evaluation of continuous and on-demand therapy with rabeprazole 20 mg. Can J Gastroenterol 2007;21(12):820-6.
. Effects of pantoprazole 20 mg in mild gastroesophageal reflux disease: once-daily treatment in the acute phase, and comparison of on-demand versus continuous treatment in the long term. Curr Ther Res Clin Exp 2005;66(4):345-63.
. Pharmacological dependency in chronic treatment of gastroesophageal reflux disease: a randomized controlled clinical trial. Digestion 2010;81(1):43-52. Epub 2009 Dec 22. Ageing and Acid-Related Disease Study Group. Short- and long-term therapy for reflux oesophagitis in the elderly: a multi-centre, placebo-controlled study with pantoprazole. Aliment Pharmacol Ther 2003;17(11):1399-406.
. Effective maintenance treatment of reflux esophagitis with low-dose lansoprazole. A randomized, doubleblind, placebo-controlled trial. Ann Intern Med 1996;124(10):859-67.
. Lansoprazole versus ranitidine in the maintenance treatment of reflux oesophagitis. Aliment Pharmacol Ther 1996;10(4):529-39.
. Maintenance therapy with pantoprazole 20 mg prevents relapse of reflux oesophagitis. Aliment Pharmacol Ther 1999;13(11):1481-91.
. Pantoprazole 20 mg is an effective maintenance therapy for patients with gastro-oesophageal reflux disease. Eur J Clin Pharmacol 2000;12(4):425-32.
. Omeprazole in patients with mild or moderate reflux esophagitis induces lower relapse rates than ranitidine during maintenance treatment. Hepatogastroenterology 1998;45(21):742-51.
. Withdrawing PPI therapy after healing esophagitis does not worsen symptoms or cause persistent hypergastrinemia: analysis of dexlansoprazole MR clinical trial data. Am J Gastroenterol 2011;106(11):1953-60. Epub 2011 Aug 16.
. Systematic review: symptoms of rebound acid hypersecretion following proton pump inhibitor treatment. Scand J Gastroenterol 2013;48(5):515-22. Epub 2013 Jan 14.
. Dyspeptic symptom development after discontinuation of a proton pump inhibitor: a double-blind placebo-controlled trial. Am J Gastroenterol 2010;105(7):1531-7. Epub 2010 Mar 23.
. Proton-pump inhibitor therapy induces acid-related symptoms in healthy volunteers after withdrawal of therapy. Gastroenterology 2009;137(1):80-7, 87.e1. Epub 2009 Apr 10.
. Are lifestyle measures effective in patients with gastroesophageal reflux disease? An evidence-based approach. Arch Intern Med 2006;166(9):965-71.
. Helicobacter pylori eradication in long-term proton pump inhibitor users in primary care: a randomized controlled trial. Aliment Pharmacol Ther 2007;25(5):585-92.
. The impact of pharmacist interventions on the inappropriate use of acid-suppression therapy. Consult Pharm 2011;26(7):485-90.
. Impact of clinical pharmacists’ recommendations on a proton pump inhibitor taper protocol in an ambulatory care practice. J Manag Care Pharm 2013;19(4):325-33.
. The Global Rating Scale complements the AGREE II in advancing the quality of practice guidelines. J Clin Epidemiol 2012;65(5):526-34. Epub 2011 Dec 19. Stopping your proton pump inhibitor or “PPI.”. Burlington, VT: Vermont Academic Detailing Program; 2013.
. Management of patients with ulcer bleeding. Am J Gastroenterol 2012;107(3):345-60. Epub 2012 Feb 7.